The first summer after we started dating, he came to our family's 4th of July cookout. Knowing his love for oreos and cheesecake, I decided to make him an oreo cheesecake. It was a mammoth thing, with an oreo cookie crust, dense cheesecake filling, and layer of sweetened sour cream, all covered in chocolate ganache. It weighed about seven pounds. My mother, also a devout lover of dessert, still talks about it. When we sat down to eat dessert, I excitedly cut Adam an ENORMOUS piece. He says it was a third of the cheesecake, but that's an exaggeration. Poor Adam, who was nervous about making a good impression on my family, felt like he had to eat the whole slice. He very nearly did, and felt sick for hours afterwards. He's never let me cut his piece of cake since. I haven't, however, stopped making him elaborate desserts for his birthday. A fews years after the oreo cheesecake, I made him a reese's cup cheesecake. Over the years, I've also I made him a peanut butter layer cake with chocolate frosting, a yellow layer cake with chocolate ganache, and naked chocolate layer cake with chocolate buttercream and peanut butter frosting. This year, I obsessed about his birthday cake for weeks. 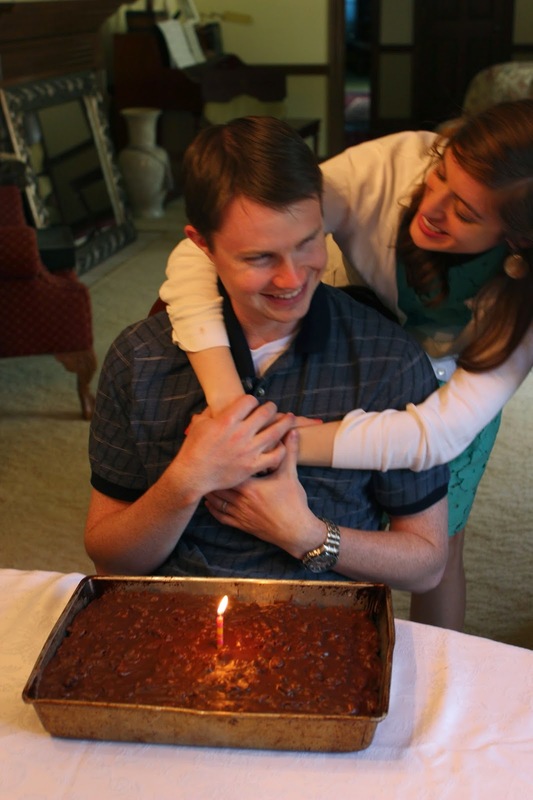 He gave up sweets for lent this year--for the first time ever--and though his birthday is 2 days before Easter, he wanted to wait until Easter to eat his birthday cake. I wanted to make one that would knock his socks off, but everything I suggested, he nixed. 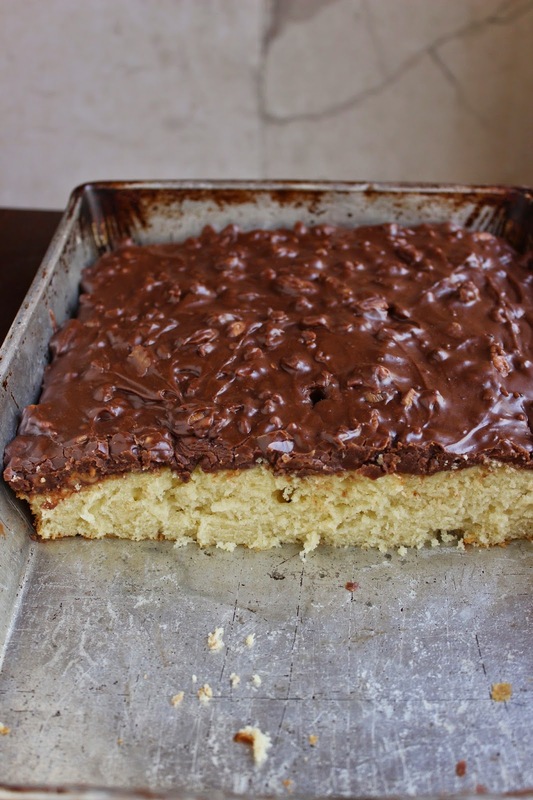 German chocolate cake? No. Six-layer chocolate cake with salted caramel ? No. Those are too complicated, he insisted. "Just make me yellow cake from a box with canned chocolate frosting." "Are you kidding me?" I gasped, "Who do you think I am?" 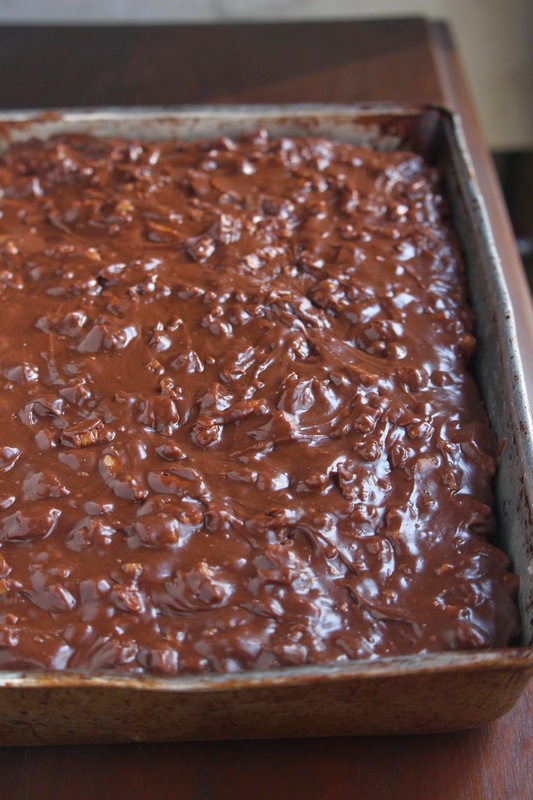 He eventually settled on a homemade yellow sheet cake, served with Texas sheet cake-style fudgy chocolate pean frosting. It was simple, and delicious, and what he really wanted all along. 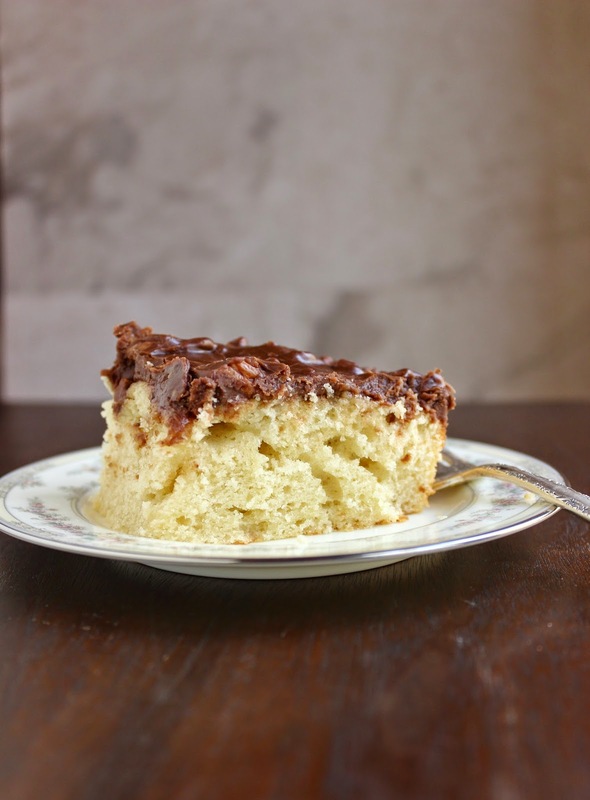 The yellow sheet cake was moist and buttery, and a perfect accompaniment to the rich (no fuss!) chocolate frosting. This is all a lesson for me I suppose. First, I need to be a better listener, and second, love doesn't have to be shown through towering layer cakes or grandiose gestures. 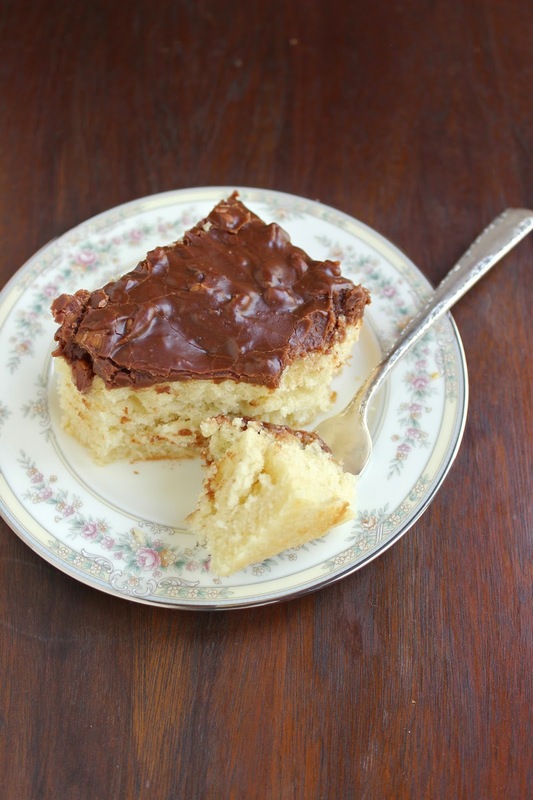 A simple sheet cake, and everyday acts of love, are just as good. Hope you have a blessed Easter, friends! Preheat oven to 350. Grease a 13 by 9 inch pan with non-stick cooking spray or butter. Line with wax paper. Grease again with non-stick cooking spray or butter. With an electric mixer, beat together butter and sour cream. Add sugar and vanilla extract and beat to combine, followed by the eggs. With the beaters on medium speed, alternate adding the flour mixture and the buttermilk. Pour batter into prepared pan. Bake at 350 for 25-30 minutes, or until a toothpick inserted comes out clean. Add butter, cocoa powder, and evaporated milk to a medium saucepan over medium heat. Stir until butter is melted, then remove from heat. Add powdered sugar, one cup at a time, whisking continually. Add vanilla extract and pecans and stir to combine. 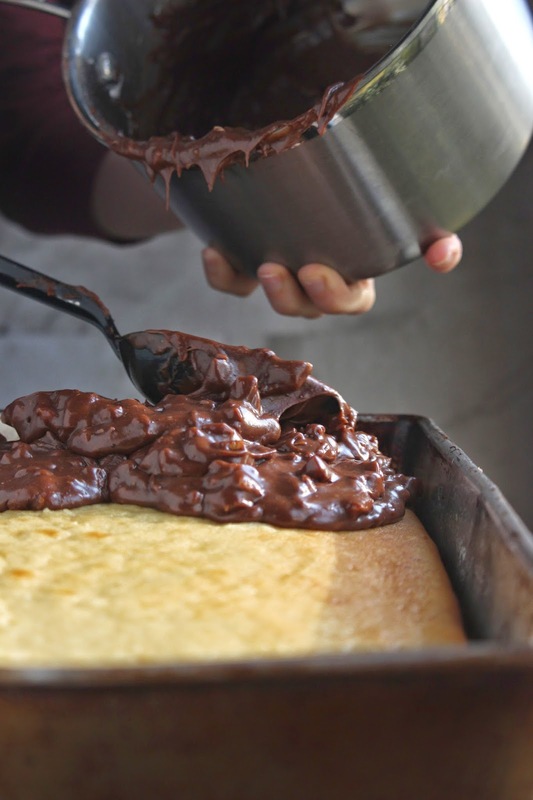 Pour warm icing immediately over cake. Dig in! This birthday cake easily serves 10 people. Skip the pecans if you'e not a fan of nuts. 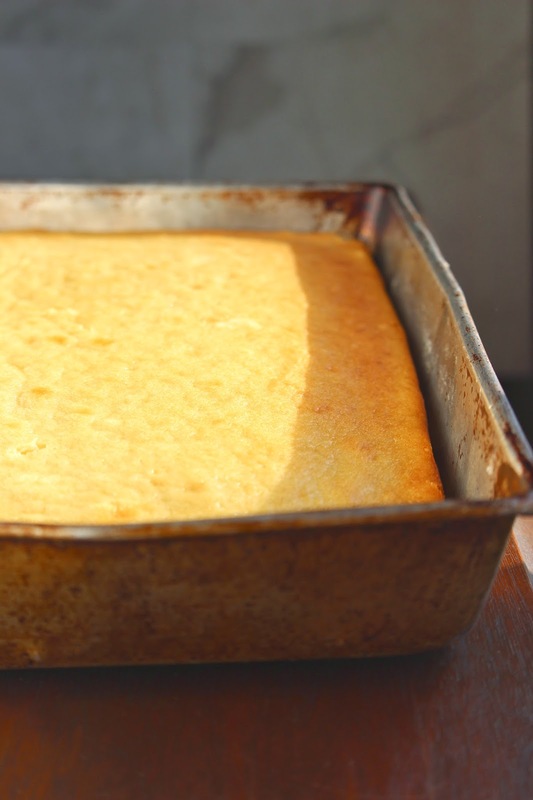 I've used the buttermilk substitute many times before, but this is a recipe where I really recommend using the real thing. It adds a wonderful flavor to the cake. Cake will be good covered and kept at room temperature for 4-5 days. You guys are the cutest! Happy Birthday Adam!! Hahahaha oh my goodness, I LOVED your story! Congrats on almost 10 years btw! I do the exact same thing with my hubby where I'll ask and think about what cake I'm going to make for his birthday for months, and usually it's something super simple he wants. I love the simplicity of this cake, it looks absolutely delicious! What a lovely story! You guys are so cute. My husband almost always picks pie for his birthday - something simple as well like blueberry. This cake looks like a perfect bday treat! 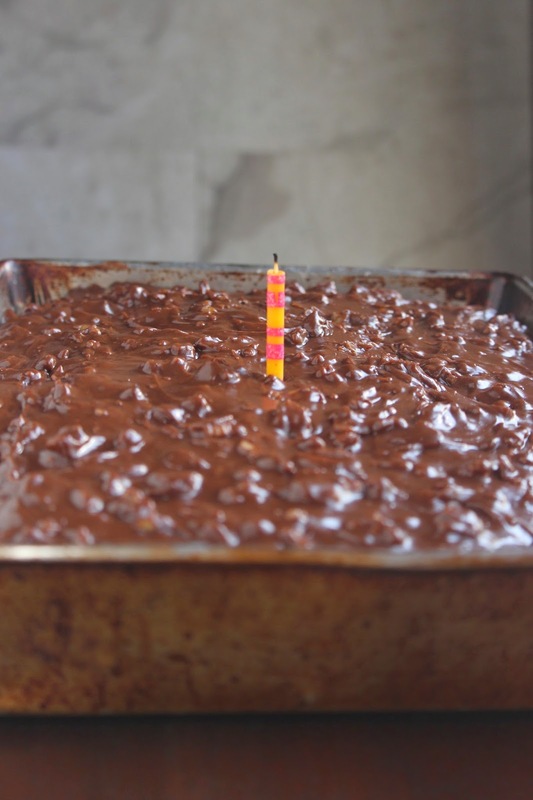 I'm sure your from-scratch cake went over way better than any boxed cake could! It looks fabulous in all of its simplicity! Chocolate cakes are absolutely one of the all time favorites. There is a big selection of chocolate cakes, with varying ingredients. An important element in a chocolate cake is the intensity of chocolate, especially in devil's food cake.